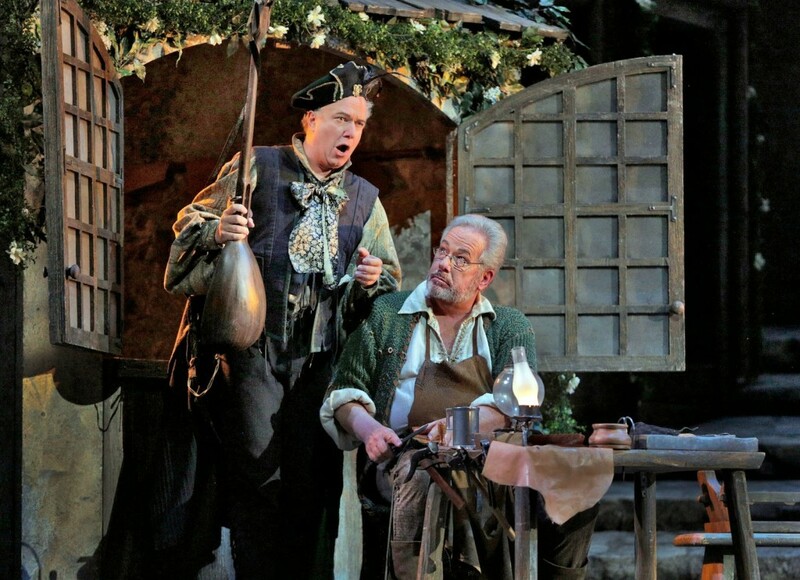 If the Met’s performance Die Meistersinger von Nürnberg of last Saturday were one of its own characters, it would be Veit Pogner. Pogner, Eva’s father, is aging, jovial, traditional, filthy rich (he is, after all, a goldsmith), not a great thinker, and maybe hasn’t quite thought through all of the implications of his grand plans. 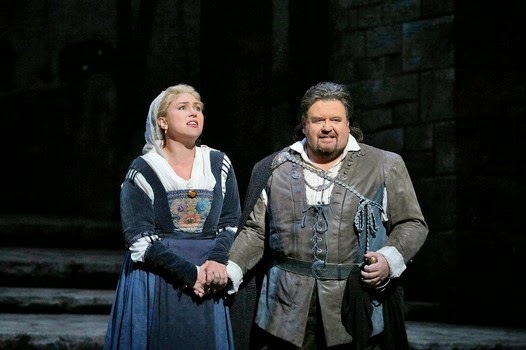 This was a solid Meistersinger, and it was a pleasure to have Wagner back at the Met after too long an absence. Most of it was good and a few things were more than good. Except for Michael Volle’s fascinating Hans Sachs, it was not daring and it was not exciting, but some meat and potatoes Wagner like we haven’t gotten in a while. Some effort has gone into the blocking for this production, probably because it was an HD broadcast, and for a long opera it generally keeps moving well enough. But the cast, with the exception of Volle–and Annette Dasch, except the text doesn’t give her much to do–didn’t find much individuality or edge to the characters, and the production doesn’t give them any context either, and the result was pleasant and satisfying but not much more than that. I think this bothers me in Meistersinger in particular because it’s such an obviously rich and ambiguous text. It’s about artistic revolution and innovation and the role of tradition and, in the last act, takes a turn towards something much darker. This is a production such a literal reading of the libretto’s events—rather than their implications—that it never risks the slightest scratch of the marker’s chalk (sorry, but this is one of the most meta operas there is). About that last act, last scene. Schenk’s parade of the tradesmen and Nuremberg festivities reach a near Springtime for Hitler density of kitsch, with the same big pretzels, but considering the monologue with which Hans Sachs closes the opera that may not be the best choice of phrase. You can argue that the monologue, a warning that holy German art is under attack and must be protected, is largely an afterthought to the rest of the opera (though I don’t agree–the thing is six hours of constructing a glorious history-also-present for German art), but even so it sits uneasily with the Schenkian preciousness that surrounds it. It’s reminds us of the text’s deeper, more complex, and sometimes far more sinister purposes and histories, something we couldn’t miss in Michael Volle’s unnervingly aggressive delivery of that monologue. He seemed like an emissary from a different production (which he kind of was since he only sang two performances of this run). Maybe he’s from the Salzburg-Herheim, which is highly instructive at this moment. But for the Met this was business as usual. James Levine’s conducting was somewhat uneven but in places vintage and not nearly as slow as I feared. The Vorspiel went badly, a bland and undifferentiated cruise without momentum or character, but things picked up after that. Some parts were very slow, much of the opening to the opera’s detriment, and the Act III quintet more successfully, and it wasn’t perfectly clean (the riot was a little closer to disorder than the score demands), but the orchestra sounded great and the balances were good, better than many of Levine’s recent exploits. Levine is an old hand with the score, and so is Johan Botha as Walther. I actually first heard him in this role, good lord, almost ten years ago at the Volksoper in Vienna. Back then his voice had an almost wondrous ease and gleam, now it has a darker, heftier texture (though he’s still on the brighter side of the Heldentenor spectrum). He still sounds like he could sing ten more verses of the Preislied without blinking, or without any more inflection that the minimal amount he expended on the first half dozen. That’s his weakness: while everything sounds good, it also all sounds the same, with clear diction but no intent behind the words. Walther might not be the most dynamic role but it helps to have at least a modicum of vocal and/or theatrical ardor present. And acting has never been Botha’s strong suit. At this performance he made a real effort to walk around but it was very noticeable that he only knows one gesture: arms slightly outstretched and palms facing outwards. It means, it seems, anything. 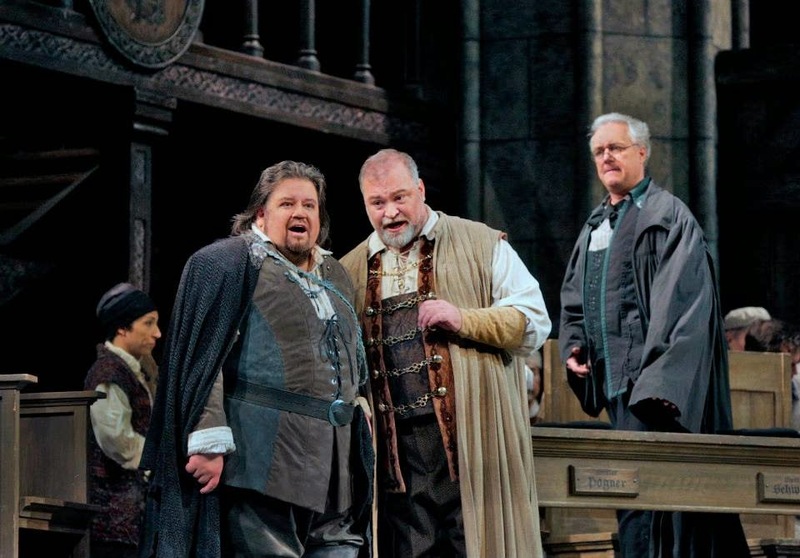 He offered little competition for Michael Volle’s Sachs, by far the most interesting character onstage. He skews youngish and baritonal for this role, and his Sachs is definitely a craftsman rather than a gentleman. (I know that might seem obvious but this role is often played with more gravitas and chin-scratching.) Yet he also gave a complex, text-centric interpretation, with considerable tension and anger in the monologues. This was not a benign portrayal, as I already mentioned above regarding the end. 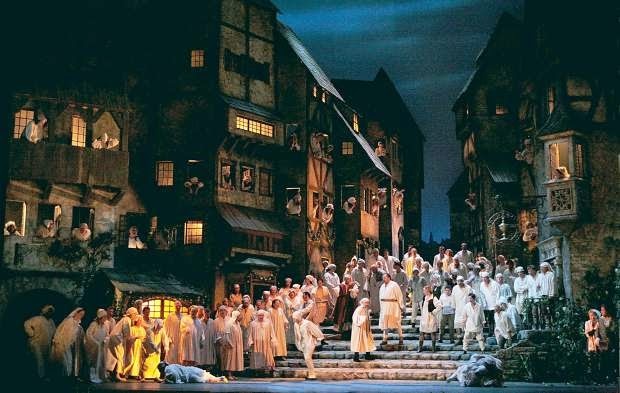 It’s funny how an opera which began about the young Walther ends with a huge chorus hailing Sachs as its hero, and there are compositional history reasons why this is the case, but Volle actually showed that as Sachs’s journey. The rest of the cast ranged from good to adequate. Johannes Martin Kränzle sang Beckmesser well, without parody or whining, but nonetheless played him for laughs. (The best thing about the DVD of this production, BTW, is Thomas Allen’s Beckmesser, a more conflicted piece of work.) Annette Dasch acted very well as Eva, taking a confusing character and making her a relatively convincing young woman, but she struggled to fulfill the vocal demands. Her soprano sounds dry and strained, and while she got through it without major incident and showed a lot of effort and control in the quintet it was not pretty. Hans-Peter König was vocal boom itself as Pogner, and I wish he would sing Ochs (though I don’t know if he does comedy). Paul Appleby made David’s long Act 1 lesson pleasant and the Act 3 song charming, and he has the right laid-back energy to act this role. Karen Cargill sounded fine as Magdalene (sorry, this is a role I never particularly notice). The chorus sounded terrific in Act 3 and not quite as terrific in Act 2. So I guess that I am glad that even in These Times the Met is still able to pull off big opera. I just wish they could be a little more consistently interesting about it. I’m waiting until 2019-2020, by which point my Herheim DVD probably won’t work because we’ll all be getting videos displayed directly in our brains. Zukunftsmusik! 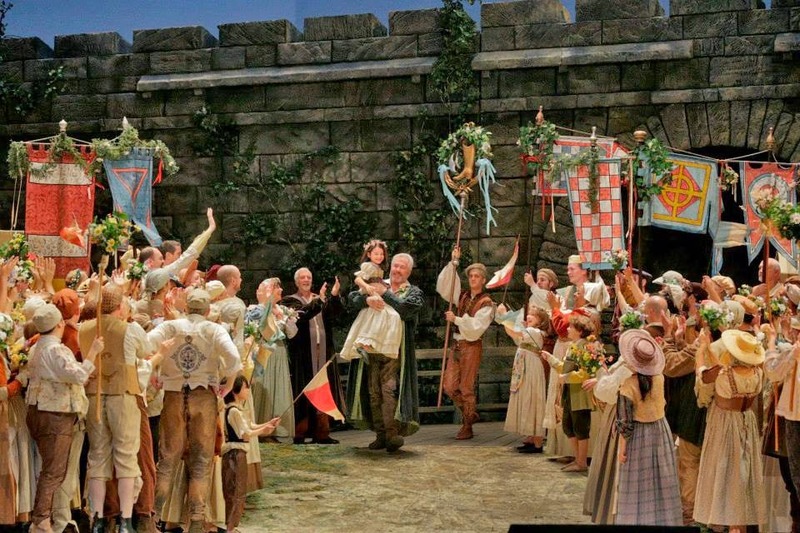 Die Meistersinger marches onward through December 23, but again with James Morris. Photos copyright Ken Howard/Met. *Musicologists: this is the production in which Ben Heppner at one point suffered the unhappy cracks which went down in Critical Inquiry’s drastic-gnostic history. 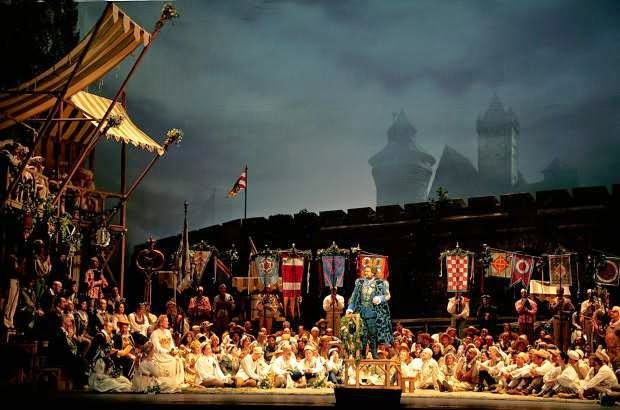 Did you ever see Karita Mattila in this opera? Only on the DVD of this production! Meistersinger isn't produced very often; this was only my third time seeing it live. I think the penultimate appearance of the Schenk at the Met was during my first year of grad school and I didn't go.